There is always a cheaper restaurant, item, tours, hotel, tuktuk driver, etc. I learned this the hard way during my short period of traveling. I ended up spending more money than I should, because I wanted to book right away or didn't look hard enough. It pays to look like a local. You can easily blend with the locals and maybe even get discounts. Take a tuktuk or ride a bike to the temples. It's nice to support the locals and see the temples at your own pace, instead of a big bus rushing you in and out. Strike a conversation with a stranger from a foreign country. I like hearing travel stories form strangers. Hearing their tales of (mis)adventures is an experience in itself. You'll get to know what kind of traveler you are by exchanging stories with fellow travelers. You'll never know when you'll need an extra friend to share the expenses with (it's all about the money muhahahaha). As you visit any country, eat local food. Couldn't get enough of Lok Lak during my stay in Siem Reap. There's more to Siem Reap than Angkor Wat. There are other more charming and less touristy temples in the Angkor Archaeological Park. There are family-owned restaurants outside of Pub Street proper where you can get good Cambodian dishes. You will never be really solo all the time. You'd be surprised as to how friendly fellow travelers are but there are also unfriendly ones. It's a nice mix to keep you on your toes. There will be kids, adults, old people, dogs, cats, and other sentient beings who will beg for your money or sell you something. This is an exaggeration but just smile and respectfully say no if you don't want to buy or give anything. 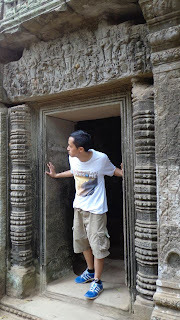 These are some tips I can share with other travelers planning to go to Siem Reap. This is from the vantage point of a rookie solo traveler. Travel is all about discovering. @KC Owens: sure why not, send me an email of your post through joshua120787@gmail.com thanks for dropping by!